Pictured Front L-R are: Roisin Heneghan, Practice Director Heneghan Peng, Oliver Cussen GDA Chair, Ger Casey GDA CEO. Pictured Back L-R are: Pat O’Sullivan GDA Project Coordinator, Elizabeth Gaynor Project Architect Heneghan Peng, Glenn O’Brien Project Manager Heneghan Peng, Noel O’Connor Director of Student Development TU Dublin, Nora Rahill GDA Corporate Affairs Manager, Conor Sreenan GDA Director of Strategy and Design. 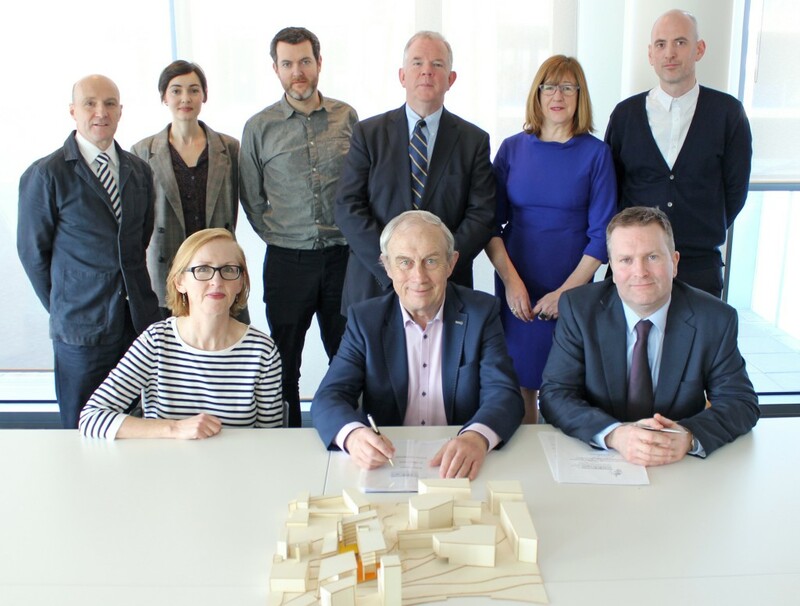 The GDA is delighted to announce the latest Design Team to join the Grangegorman Project. Heneghan Peng Architects have been appointed to design the next Technological University Dublin (formerly DIT) building – the West Quad – which will include the College of Business, School of Social Sciences and Law, as well as the main conferring venue for the new campus. The West Quad will be located at the western boundary of the Grangegorman site, with the HSE Phoenix Care Centre to the north and adjacent to the North House (which will become the Academic Hub and Library in the next phase of development).